Greetings, pirates! With our most recent Scale Test now done and dusted, we bet you've come looking for your latest Sea of Thieves fix. Well, while you were off helping us test the game, we were busy writing about our most recent Inn-side Story video – but you probably knew that, that's why you're here! Customisation is a hot topic for all you fashion-savvy pirates out there. It's important to be able to choose how you present yourself to the world. Do you want to make sure everyone knows that you and your crew are the meanest and baddest on the sea? Or how about a bit of the old bait and switch? Adorn your ship with the most basic of attire to trick any would-be aggressors and lead them to a watery end! Exciting stuff! 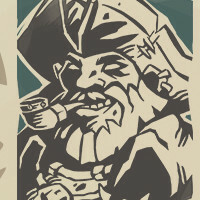 We can't wait to see how our players choose to customise their pirates and ships. Don't forget, you can keep in touch with us via our social channels to give us your feedback, tell us your stories or just have a chinwag.